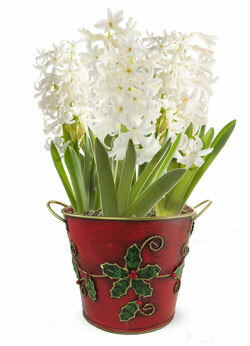 Description: It’s become a modern Christmas tradition— white hyacinth blooming indoors at the holidays! We plant 5 premium bulbs in a festive red tin with Holly leaves. These cheerful, fragrant blooms make a great flower gift to brighten a home during dark winter days. We top each gift plant with decorative moss, and pack for safe shipment to ensure it arrives ready to display. Simply water, and the flowers open in just 4 to 6 weeks. Tin measures 6” diameter x 5” height.